Introducing TR70 – High Brightness RGBLA Stage Light with single optic blended beam in a small and light form factor. Luxium Lighting introduces TR70, new to the TRIUMPH line of full-color stage lights, a compact 3,300lm fixture with an RGBLA COB and single hybrid optic. PORTLAND, OR, UNITED STATES, October 15, 2018 /EINPresswire.com/ — PORTLAND, OR, October 12, 2018. Luxium Lighting is excited to introduce TR70, the newest member of the TRIUMPH family of full-color stage lights, a compact and powerful stage light with an RGBLA COB and a single hybrid optic. This PAR Can LED luminaire uses an exclusive Luxium high-performance 6-channel LED engine and a high-performance LED array. The TR70 offers both full-color adjustment and selectable white CCTs ranging from 2100K to 6500K with the highest efficacy. 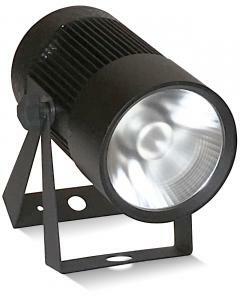 The result is a small and smart 3.5 pound stage light that delivers over 3300 lumens in a single fully-blended 15 degree beam. Convenient wireless DMX operation is included along with rugged and handsome aluminum construction for professional use in performance and retail venue applications. Exquisite lighting quality, advanced wireless control, and a compact design, at an affordable price, make the TR70 a new standard for lighting designers and theater managers. The TR70 incorporates Luxium’s proprietary system for perfect and uniform color mixing, with zero flicker and smooth dimming. The result is an unmatched palette of colors and selection of calibrated CCTs from warm to cool to satisfy any lighting requirement. With a native beam angle of 15 degrees, and a number of optional diffusion lenses to expand the beam, this instrument creates intense washes of color or high CRI whites that are easy to preset and control for any application. The TR70 is useful for stage lighting in addition to highlighting merchandising displays and accentuating walls, podiums, works of art, pillars, and other architectural elements. Each TR70 includes a Luxium wireless DMX receiver. For long-distance operation, it’s simple to set up and connect with the Luxium TRX1 wireless control hub allowing either DMX512 control or direct operation from the transmitter with user programmable sequences and modes. A new Luxium app called TRIXY also allows the TRX1 to be controlled from an iPad, with easy-to-design sequences and fades. Ideal for up-lighting, wall-washing, or front-lighting, the TRIUMPH luminaires are all fitted with a dual yoke/carry handle — they can simply be dropped in place or hung as needed. Measuring 4” across and 7.5” long and weighing just 3.5 pounds, these fixtures are easy to store, transport, set-up, and operate. Come see the new TRIUMPH TR70 wireless DMX light at LDI 2018 on display in the Luxium booth #441. Luxium will also show and demonstrate other amazing entertainment lights and controls that are bringing high quality, colorful lighting, and ease of use to new places. Contact us at: info@luxiumlighting.com or call 833.LUX.LITE for more information — or to ask about getting a demonstration of this fabulous new lighting instrument. For lighting designers, event producers, and architects who are seeking beautiful and smart LED lighting systems that are truly easy to deploy and use, Luxium is the right solution. Whether the need is for colorful venues, enhanced mobile entertainment, or exquisite house lights to improve the audience experience, Luxium is advancing the state of the art in color-adjustable lighting for places where high-quality and human-centric illumination with precision control is crucial. Unlike traditional lighting fixture providers, Luxium is intent on developing versatile and high-performance luminaires anyone can use. The designs are compact, efficient, and optimized to meet the needs of each application with attention to useful innovations that incorporate the best technology and features for many different places.